Far away in a distant galaxy, there is a beaming face smiling back at us. 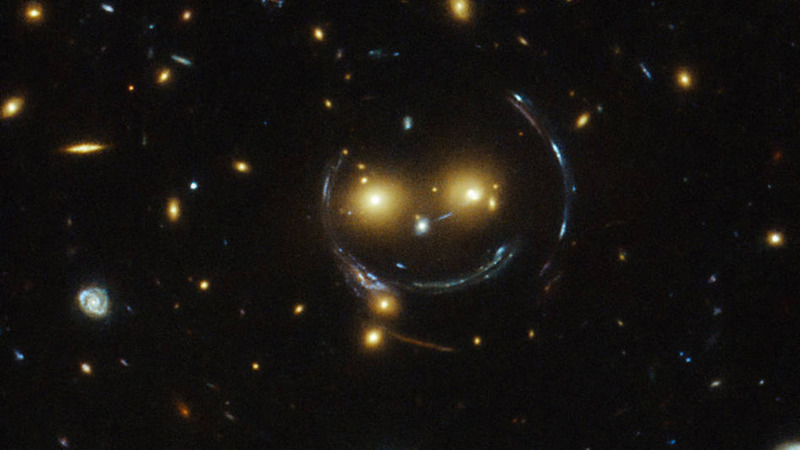 Hubble scientists recently discovered this galaxy cluster — massive structures that exert a gravitational pull strong enough to warp the spacetime around them (nbd) — that resembles a face with two bright eyes, a button nose and a smile. Pretty simple, right? If you didn’t catch that, you can always refer to Einstein’s theory of general relativity, which explains this phenomenon. The Hubble Space Telescope orbits Earth at about five miles per second; a complete spin takes 97 minutes. The Hubble routinely delivers these images from deep space, helping us further understand big concepts like the age of our universe. One of Hubble’s most famous images is called the eXtreme Deep Field, the farthest-ever view of the universe, which reveals thousands of galaxies billions of light years away.